Type location Tanzania (Camponotus maculatus Fabr. subsp. n. minusculus, Viehmeyer, 1914c: 44, major & minor workers & queen) from Manow, Bez. Langenburg; major & minor workers & queen described . 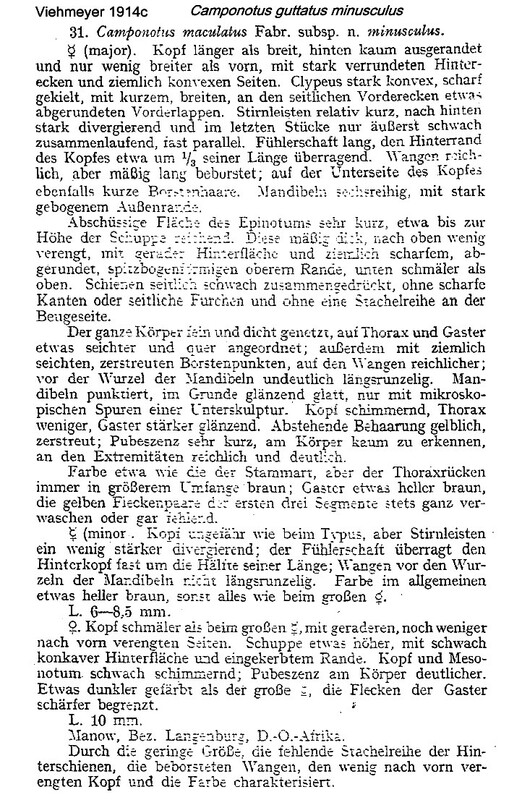 Viehmeyer's (1914c) description is at . Santschi (1915c: 282) gave a note and illustration, this is at . Curiously, Emery (1920c: 6) listed it as a subspecies of the reddish-yellow species Camponotus guttatus from Cameroun. 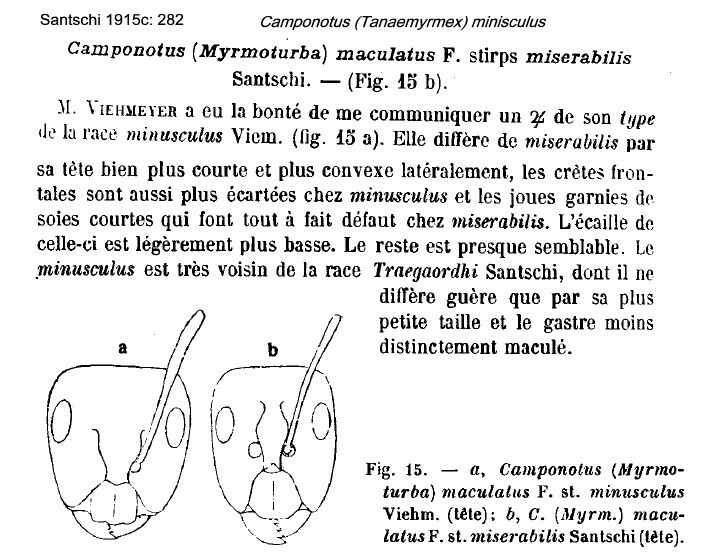 Santschi (1915c) had noted how, in comparison with Camponotus maculatus miserabilis, the specimen of a minisculus major sent to him by Viehmeyer had a shorter head which was more convex laterally, the frontal carinae were wider apart and the genae had short silky hairs (none in miserabilis); also the petiole scale was slightly lower. 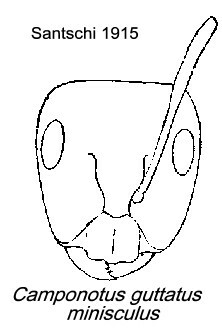 He thought minisculus was close to Camponotus traegaordhi (type location South Africa, Santschi, 1914e), from which it differed by its shorter length and less distinctly patchy gaster. 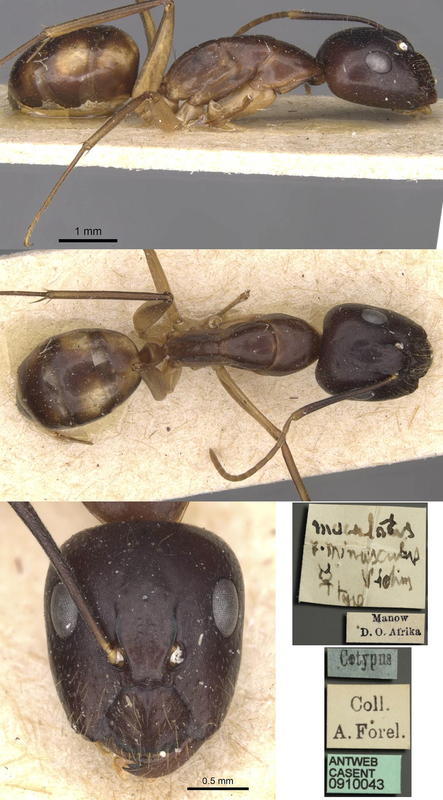 The photomontage of the type major worker is collated from http://www.antweb.org/specimen.do?name=casent0910043. The photomontage of the type minor worker is collated from http://www.antweb.org/specimen.do?name=casent0910044.